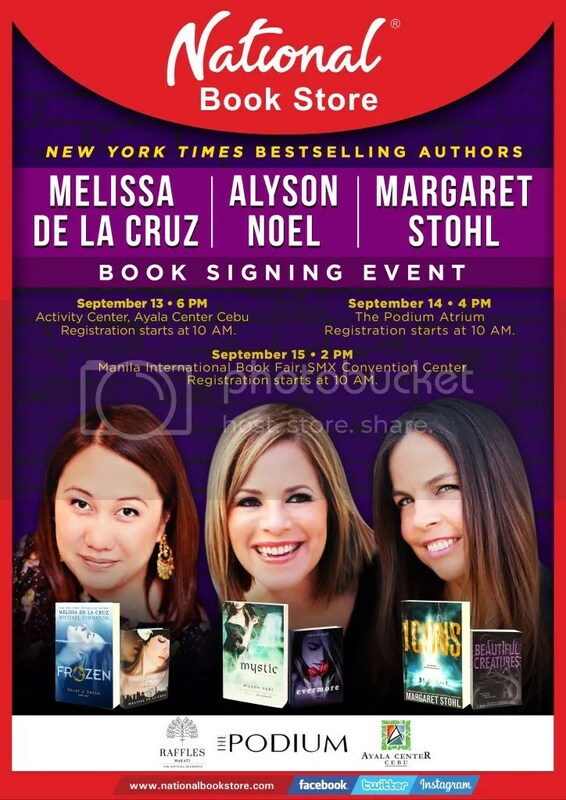 National Book Store brings three New York Times bestselling authors—Melissa de la Cruz, Alyson Noel and Margaret Stohl—for book signing events on September 13 at 6 pm in the Activity Center of Ayala Center Cebu, on September 14 at 4 pm in The Podium Atrium and on September 15 at 2 pm in the National Book Store booth at the Manila International Book Fair in the SMX Convention Center. Filipino-American Melissa de la Cruz is the author of the Blue Blood series, a popular vampire novel which has three million copies in print. Her latest novel Frozen is the first book in the Heart of Dread series, co-authored by her husband Michael Johnston. It narrates Natasha Kestal’s journey out of New Vegas, a city blanketed in ice, to the paradise-like and mythical land called “the Blue,” where the sun shines and where she will not be persecuted even if her darkest secret comes to light. Alyson Noel is the bestselling author of the Immortals series and its spinoff the Riley Bloom series. Her books have been translated into 37 languages and sold in over 50 countries with over seven million copies in print. She is currently working on her latest series The Soul Seekers, which includes Fated, Echo and Mystic. It tells the story of Daire Santos, who after setting out to harness her powers as a Soul Seeker, one who can navigate the worlds between living and dead, is forced to discover if the boy from her dreams is the one she’s meant to be with or is allied with the enemy she’s destined to destroy. Margaret Stohl is the co-author of the Beautiful Creatures series with Kami Garcia. It was named as Amazon’s #1 Teen Book of 2009, and its movie adaptation was released by Warner Bros. earlier this year. Her latest novel Icons, the first book in a new young adult dystopian series, follows the story of four teens, who use their superpowers to save the world after an alien invasion referred to as “The Day.” Dol, Ro, Tima and Lucas try to piece together the mysteries of their pasts and discover that their uncontrollable emotions may actually be their greatest strengths. The events are made possible in partnership with Raffles Makati, The Podium and Ayala Center Cebu. Books by Melissa de la Cruz, Alyson Noel and Margaret Stohl are available in National Book Store, Powerbooks and Bestsellers branches. Shop online at nationalbookstore.com. Follow National Book Store on Facebook, Twitter and Instagram (@nbsalert) for the latest events, promos and contests. BOOK SIGNING GUIDELINES AND F.A.Q. Registration opens at 10:00 am on September 13 at the Activity Center of Ayala Center Cebu and at 10:00 am on September 14 at The Podium Atrium. Each guest will be asked to fill out the registration form upon arrival. Separate registrations for each event is required should you wish to attend both events. First come, first served. Is there a limit as to how many people can have their books signed? We do not have any preset limit. However, should there be an excessive number of people, we reserve the right to limit the number of people who can have their books signed. How many books can I have signed? You may have up to 6 books total signed. The 6 books can be in any combination as long as the total number of books to be signed is 6. For example, 3 with Melissa De La Cruz, 3 with Alyson Noel and 0 Margaret Stohl; or 6 with Margaret Stohl and 0 for Melissa De La Cruz and Alyson Noel. Only books purchased from National Book Store, Bestsellers or Powerbooks will be accommodated. When and where is the book signing at the Manila International Book Fair (MIBF)? The MIBF signing will be on Sunday, September 15 from 2:00 pm to 4:00 pm in the National Book Store booth. For more information on the MIBF, you can go to http://www.manilabookfair.com. Do I need a separate ticket to get into the MIBF? Yes, you will still need a separate ticket to get into the MIBF. Registration for the book signing at the Manila International Book Fair opens at 10:00 am. Only the first 200 registrants will be given a signing slot. Each guest will be asked to fill out the registration form upon arrival. First come, first served. Wow. Powerhouse trio. Only the first 200 registrants though? With the crowds at MIBF, that will be tough! Did they have a similar guideline for Kiera Cass’ signing? There was no limit for Keira either. She insisted she will sign no matter how many, and ended up signing for 600+ in Manila, and 300+ in Cebu.